Abstract: The early orthodontic management of a severe Class II division 1 malocclusion and its advantages are discussed. Two cases are described, both of which were successfully treated on a non-extraction basis, with a phase of functional appliance therapy followed by fixed appliances. Clinical relevance: The article outlines how, with careful case selection and early treatment, severe overjets can be successfully treated with orthodontics alone. Author notes: Shayma Witwit, BDS, MJDF, Dental Core Trainee in Oral and Maxillofacial Surgery and David John Spary, BDS, LDS RCS, FDS RCPS DOrth, Orthodontic Consultant, Queen’s Hospital, Burton upon Trent, UK. 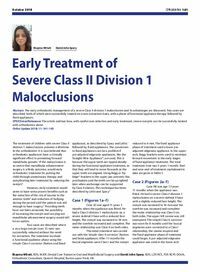 Objective: To understand the benefits of early treatment of Class II division 1 malocclusions and outline an alternative technique in the management of the cases presented.